At the start of the Spatial Thinking Game, the player can choose one of three buffer distances around the toxic waste barrels (shown as red triangles). 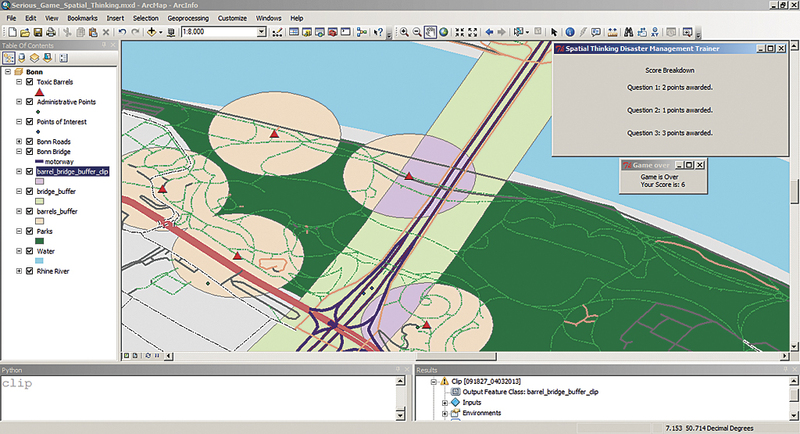 The GIS tool choices selected by the game player are used to score the game player's spatial thinking ability. The Python window displays the code, which incorporates the ArcPy library, used to create the game and an external JSON file. “Serious” games are games with a nonentertainment purpose. Spatial thinking is the idea of using the property’s space to structure and solve problems. It is critical to decision making in response to a disaster. A team of student researchers at the Rochester Institute of Technology (RIT), working in partnership with the United Nations University Institute for Environment and Human Security (UNU-EHS) in Bonn, Germany, have developed a serious game in ArcGIS designed to measure the spatial thinking ability of disaster responders. The game uses a disaster response scenario where toxic substances have washed up on the shore of the Rhine River in Bonn, Germany, after a flood. 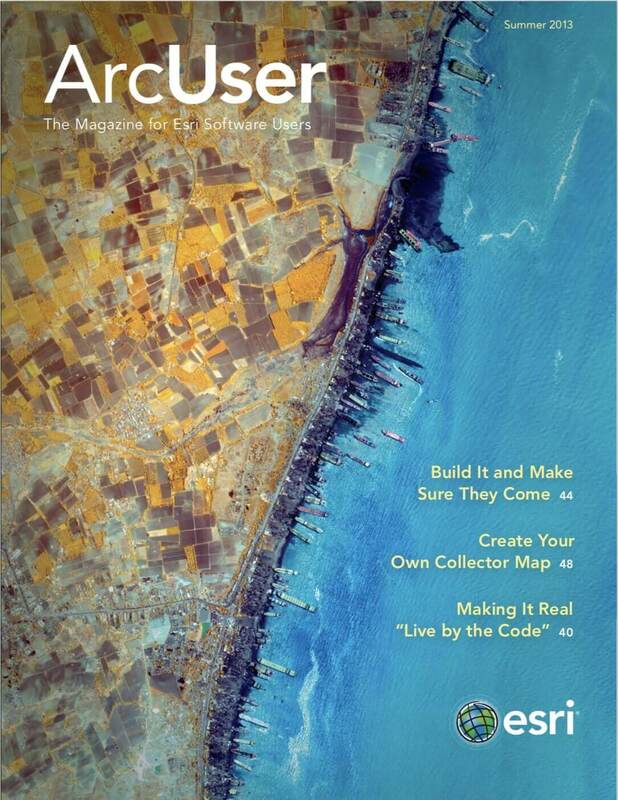 The game player is given a series of questions designed to measure spatial thinking abilities based on which ArcGIS tools they would use to respond to the disaster. Using real GIS data and tools in the game makes it particularly useful for realistic disaster management training. The following sections discuss the game in further detail and provide ideas for future work. Pressing the button for Option 2 runs the underlying Python code, uses ArcMap functions, creates a 500-foot buffer around the toxic waste barrels, and updates the map. Next, the player is presented with options for determining risk to populations using buffers. Upon starting the game, the user is presented with a representation of the affected area in ArcMap. The map includes features such as parks, roads, public buildings, general points of interest, as well as the location of the toxic barrels along the Rhine River. The scenario data for the game was obtained from OpenStreetMap, but any data that ArcMap can import can be used in the game. Beginning with the first game question, the gaming interface displays information taken from the JSON file for the current scenario that provides from one to five possible choices for the game player to select. When the user selects one of the choices, the gaming interface repopulates with new information based on that choice. 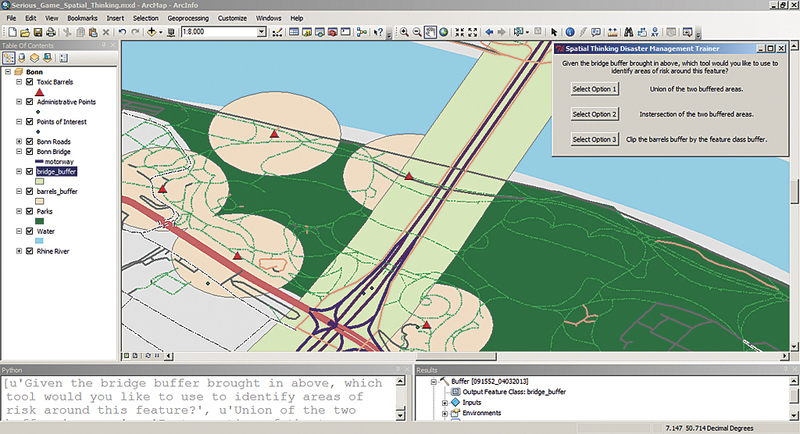 Also, if a particular GIS operation is required (say, creating a buffer around a bridge), the appropriate ArcMap tool or model is called using the ArcPy library. Results of the selected choice are then displayed in ArcMap. By using this approach, game players do not focus on technical details of using various ArcMap tools. Instead, they focus on spatial thinking and decision-making tasks. Furthermore, this approach allows game players who are not familiar with the capabilities of GIS to see how a real GIS environment operates. The goal in developing the game was to measure spatial thinking. To do this, each decision the user makes is associated with a given score. For example, a user who chose the buffer tool to create multiple buffers around the chemical barrels would receive a lower score for that particular question, while a user who correctly selected the Multiple Ring Buffer tool would receive a higher score. The options available to the player are adjusted based on the initial choice. Selecting Option 1 creates a buffer around the bridge. 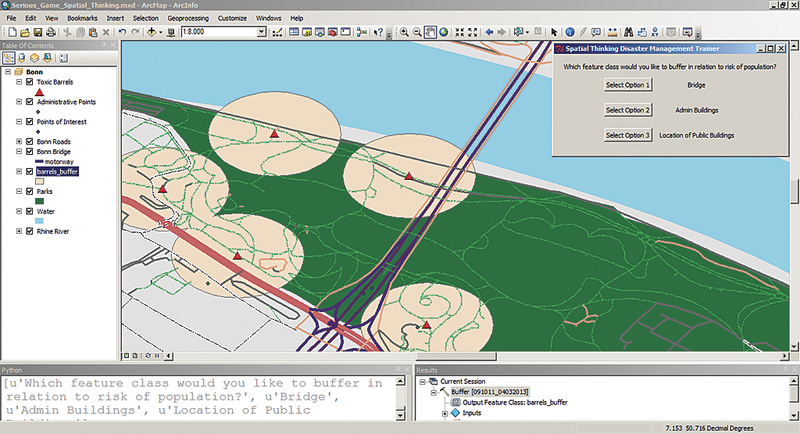 The question prompt asks the player to choose a geoprocessing tool to identify risk areas in relation to the bridge buffer that was previously selected. The player is now presented with one last set of options. In addition, timing was incorporated into the game to simulate a sense of urgency to replicate the tense, stressful situations emergency responders face in real disaster response situations. Users who need more than the allotted time to make a decision receive a reduced score, even if they make the correct decision. Upon completion of the game, the points for each question are added to present the user with an overall score that represents their grasp of the spatial thinking ability required in the game. The program also reports any discrepancies between the user’s selections and the ideal choices and discusses what the user could have done better and why another choice may have been the better option. 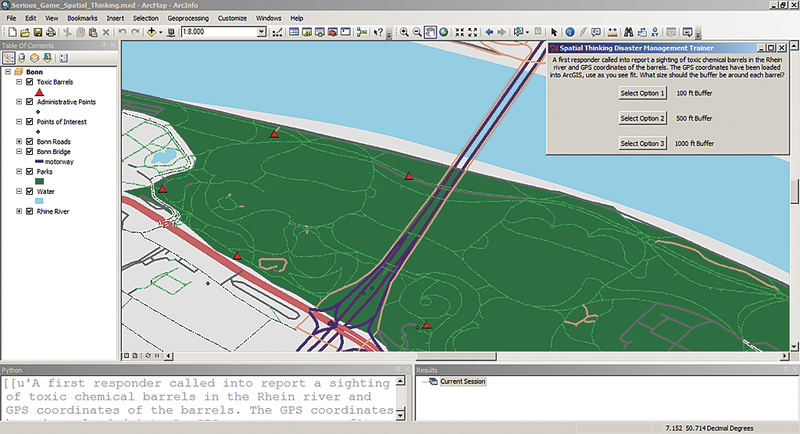 ArcGIS compatibility with Python programming was essential in the development of a serious game aimed at measuring spatial thinking abilities using ArcGIS. Future work includes expanding the game for other types of disaster response scenarios and formal testing of the game with emergency management practitioners. Serious games like this one may find a place in testing the knowledge and abilities of emergency responders prior to disaster situations without incurring many of the costs associated with developing more realistic, hands-on scenarios. Furthermore, the game can be expanded beyond specific applications like emergency response to use as a general approach for teaching spatial thinking and GIS concepts. Selecting Option 3 clips the buffer around the bridge and the toxic barrel buffer and outputs them, concluding the game. The player's final score is based on the specific choices made during the game. Scores range from 1 for limited spatial thinking to 10 for good spatial thinking ability. A breakdown of points earned for each response is also provided so players can learn to make better choices. The work presented in this article was conducted in part by graduate students at the Rochester Institute of Technology funded through the National Science Foundation Science Master’s Program “Decision Support Technologies for Environmental Forecasting and Emergency Response” (NSF DGE-1011458). Kevin Bloechl and Amanda Geniviva are students in the imaging science master’s program at the Rochester Institute of Technology. Zachary Miller and Matthew Nadareski are students in the computer science master’s program at the Rochester Institute of Technology. Alexa Dengos is a student in the environmental health and safety master’s program at the Rochester Institute of Technology. Emily Feeney is a student in the professional studies master’s program at the Rochester Institute of Technology. Alyssa Mathews is a student in the environmental science master’s program at the Rochester Institute of Technology. Jonathan Nelson is a student in the science and technology master’s program at the Rochester Institute of Technology. Jonathan Uihlein is a student in the information technology master’s program at the Rochester Institute of Technology. Michael Floeser is a lecturer in the department of information sciences and technologies at the Rochester Institute of Technology. Dr. Jörg Szarzynski is the head of the Enhancing Graduate Educational Capacities for Human Security Section (EGECHS) at the United Nations University Institute for Environment and Human Security (UNU-EHS) in Bonn, Germany. Dr. Brian Tomaszewski is an assistant professor in the department of information sciences and technologies at the Rochester Institute of Technology.